This team is currently 7-0 and are most likely to move up the ladder in Poland. A program that's being built by coach Lonnie Hursey is now shining on the field. 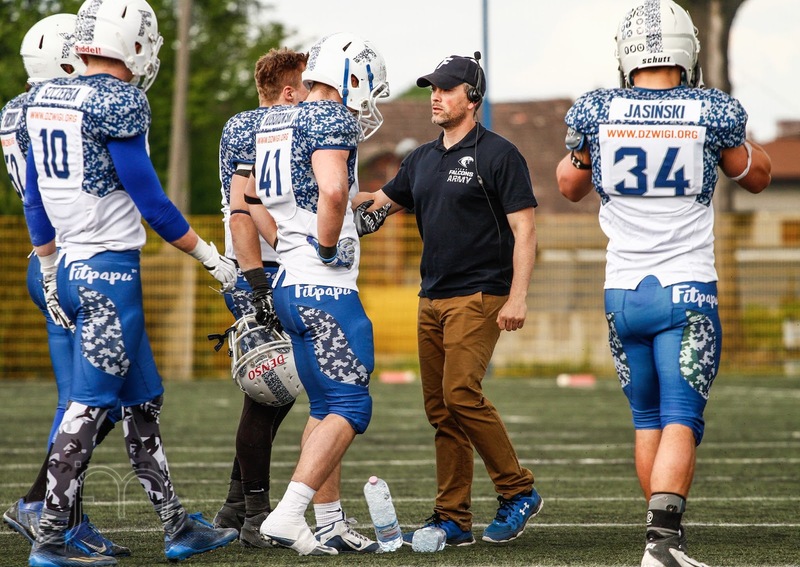 Coach Hursey was the one to introduce us to the hard work everyone is putting into this team, and there were no doubts on featuring Tychy Falcons. 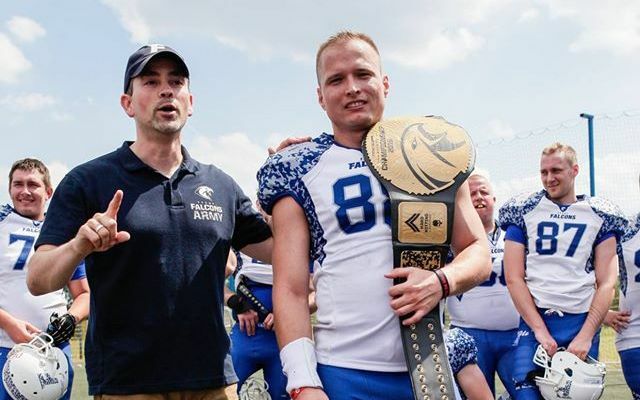 Falcons founder - Pawel Chwedczuk, and president - Lukasz Pawezka shared their teams story. Before we started a team, we bought American football ball just for fun (turned out it was a pee wee, but we didn’t know before we bought an adult one), and prior to that, we loved to play Madden in our free time. It was a whole mix of kids and teenagers, we were playing on half accurate rules with some rugby flavor (we had no equipment). When it comes to the team itself - it all started in May 2008. We were just two guys - Pawel Chwedczuk and Arek Wojtasik. After seeing on TV, that a polish league was established - we thought why not to compete as a proper team? Whole idea seemed ridiculous at the time, because Poland and American football don’t match at all. After all, we’re as most European nations - a soccer place. First steps were recruiting coaches. 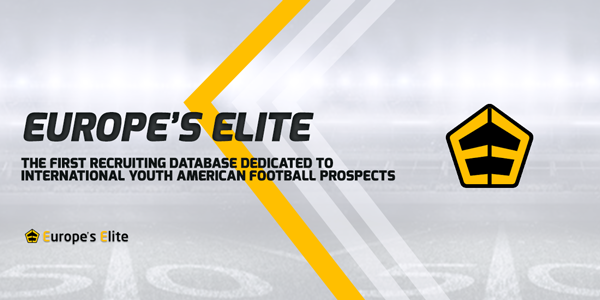 Things weren't as easy as we expected them to be, because there were no ‘coaches looking for teams database’. At least we managed to find an enormous amount of articles, rule books, coaching books etc, so I was like “okay, we gonna do this on our own”. I (Patel) became a coach because we had no other option and Arek was our first QB, even though we didn't have the team yet. Next step was learning the game, watching 3 million YouTube videos and planning how to get this thing started. We picked the name relying on some values that we wanted to have as the team, and a bit of history. Also, we made our first logo, cause believe me “Fake it till you make it” isn’t an empty expression, it’s the key in many ways. So, as Tychy Falcons, we started posting on our city’s internet forum because Facebook wasn’t that popular in Poland back then. 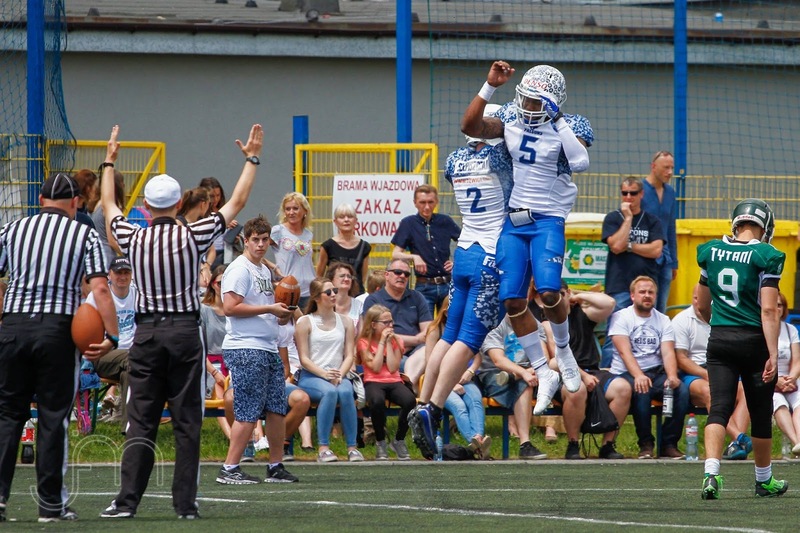 We posted something like “Hi, we are starting an American football team Tychy Falcons, first practice is July 13th, 2013 at 9.00 please post here if you’ll show up”. We had one month untill our first practice. 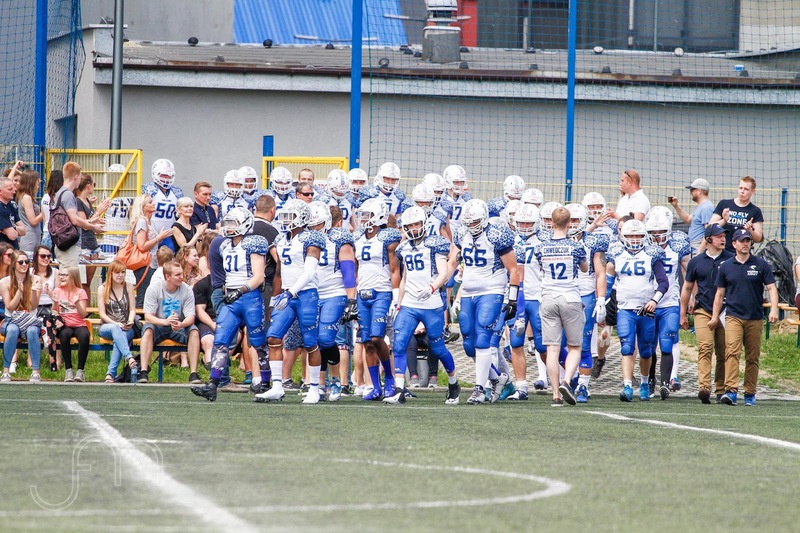 Meanwhile, founder of Gliwice Lions (nearby team) reached out to us and offered help with the first practice. Out of 21 people who applied to show up, 13 of them came to the first practice. It was a start of something bigger than we expected. We had many many ups and downs, people were coming and going, so there were some really hard moments especially after 1,5 years of practicing, we had weeks when 2-4 people showed up. It’s tough when you are sacrificing all of your time and energy and things like that happen. It’s extremely important to keep your mind on a goal then, because if you stop showing up - all that you've build will collapse in a second. One thing we knew is that we have to set the example, so we showed up every single time for almost 2 years.. Rain, snow, burning sun, 8 people, 2 people, no matter what we - were always there. People can see the commitment and start to believe it’s something real. So if I can give any advice - In the beginning, you, as the founder, are the example. If you always do what you expect of people, plus a little more on the side, they will start following. Just make them believe it makes sense and make them feel like an important part of the whole process. That will build a solid human base for the future. We had no luck finding coaches, so I became one on the go. I had to learn a lot and try to look as professional as I could at the time. First practices we’re fun, it was a bit of everything - running routes (no matter if you are big or small), some tackling, lots of cardio and push ups, short game after all that, and team building exercises - mostly obstacle races with everyone involved. Always a mix between fun and hard work. You have to keep it fun in the beginning, especially because you can’t play a proper game without the squad and gear, so at least keep things interesting. The main goal was to play our first fully equipped game and join the league, but it was a bumpy road ahead and a lot of organizational/paperwork stuff to do and money to find. Equipment was one of the toughest things we had to take care of. We had no stuff at all, except a few balls we bought from our own money. As most of the teams - we have ‘you are buying your own stuff’ policy. 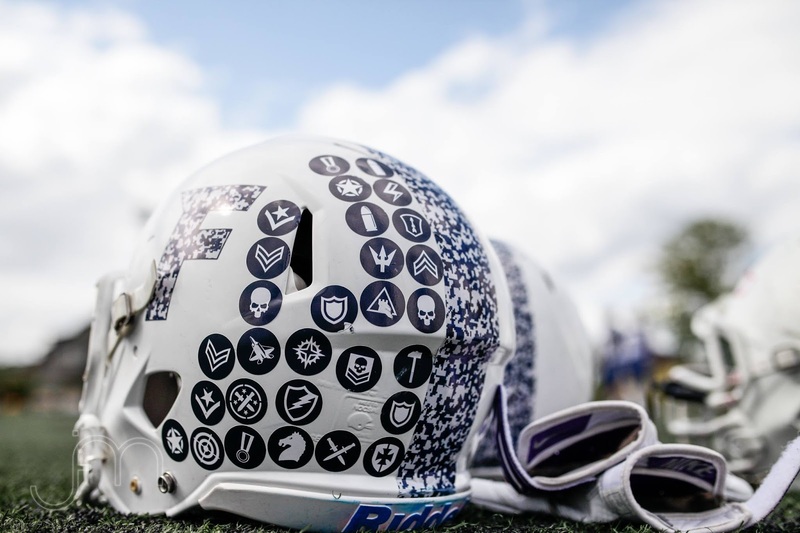 So after year of regular practices, one of our players took a risk and bought the first shoulder pad, which was a big thing for us because we were all 18ish, and spending like ¼ of polish average wage on football gear was a big commitment. After that, players started buying their own gear, at first mostly pads, and then helmets - because they were a lot more expensive and it wasn’t easy to buy gear in Poland. First we had our practices at some random field, by the woods. There was a group of soccer players which did the lawn-mowing from time to time, so it was perfect for setting everything up. Only thing, in the summer, mosquitoes would go crazy on us, but that's a price to pay for practicing next to a forest. In autumn, when it would start getting dark earlier, we managed to start renting a field from our town, and it was almost for free. It was in a really bad condition, sandy/muddy, which made many ankles turn, but hey, we had the lights so we could practice during winter too. Still no locker rooms, but with time we got used to changing clothes outside at -10C. After two years of going to city’s sport department, we finally got ourselves an almost even, grass field. We did our job on making it even, repairing the holes and cleaning after dogs, but it was all worth it. So that was it - our Falcons field in city park. When it comes to other training equipment, we really did not have much except for balls, cones, and a few plastic hand made step over dummies, until Coach Lonnie Hursey came on board 2 years ago. Ever since then he has found ways to get pretty much everything we could ever need. We went from having an equipment shed that was virtually empty to having 2 sleds, a lineman chute, lineman boards, 2 tackling rings, and all kinds of other stuff. He also made a point that we all need to look exactly the same when we step on the field. Nothing is worse than going to a game and seeing a team with different color helmets or face masks, different color sleeves that are not team colors and jerseys that were from 2 or 3 different sets. If you want to be looked at and respected as a professional organization, you better look like it as well. If you invite fans or potential sponsors to the game, you want the production value to be good. You can't expect a business to give you money if you look unorganized and unprofessional playing on a cow pasture. We are in the PLFA1 league right now (We won PLFA2 a few years ago), but our goal is to win and get promoted to the Top League for next year. During the last few years - we were in the semi finals but could not get past it. Currently we are 7-0 with the #1 offense and #2 defense in the whole league. From day one it has been preached about staying focused, and each week we must respect the process no matter what team you are playing. Even if its a team you beat by a lot in the past, you still must do everything the same, because if you take a team for granted, you can take a loss or guys can get hurt. Losing games is hard, you put so much time and effort into the season that its hard to flush and move on, but that's exactly what you have to do. The guys here are very competitive. We compete in everything, because guys here want to be the best. It does not matter if we got a win or a loss, the next practice we have the majority of the guys there looking to get better. There have been a few times we have given the guys a week off or a day off (because of bye week or 2 bye weeks), and the guys argue because they want to practice. After the break they come back even more hungry and motivated. There are many things we do as a team on and off the field. We have team BBQs a lot during the summer at the lake, we also have what high school teams do - 450 kg (1000 pound) club where anyone who wants to play for our team must be in the gym at least 3 times a week and every 3 months during the off season, so we can do testing and everyone continues to improve. If all 3 Max lifts equal 450 kg, you get a shirt and special recognition (Bench/Squat/Dead lift). We had more than a few guys raise their maxes over 100 Kg from September test to the March test. Everyone pushes each other to get better and supports each other. We have no problems accepting people and them becoming family, because here in Tychy, we have players who travel up to 2 hours to come out for practice. They see how we do things the right way (practice, organization, management, look professional) and want to be part of that. There is no such thing as poaching players in Europe. If a player leaves, it's because he's not getting something he wants with his team and sees how someone else does it, and wants to be part of that. It's hard to believe how far the club has come in just a short period of time with a very small budget. 2 years ago we started doing pride stickers for each game, based on individual and group (offense/defense) achievements. After every game, guys are excited to know how many pride stickers they earned. The championship belt is also a huge thing here. Coach Lonnie has been doing it for years and the guys take pride in trying to win the belt. Its an actual WWF championship belt that has been modified with our team logo and looks amazing. Since we are not a soccer team (laughs), we have to work on our recognition in the city and also in our region. We are doing our best to participate in all local events by organizing football games for children, giving them an opportunity to try on and wear our equipment, throw the ball, etc. This is the best way to get more interest and it really works, we always have a big group of kids at our stand. We also work with schools in order to organize physical education classes once every few months. Besides that, our team organizes charity games, helping to collect the funds for people that are disabled or organize special labels „You are beautiful” for all women during the Omens Day. 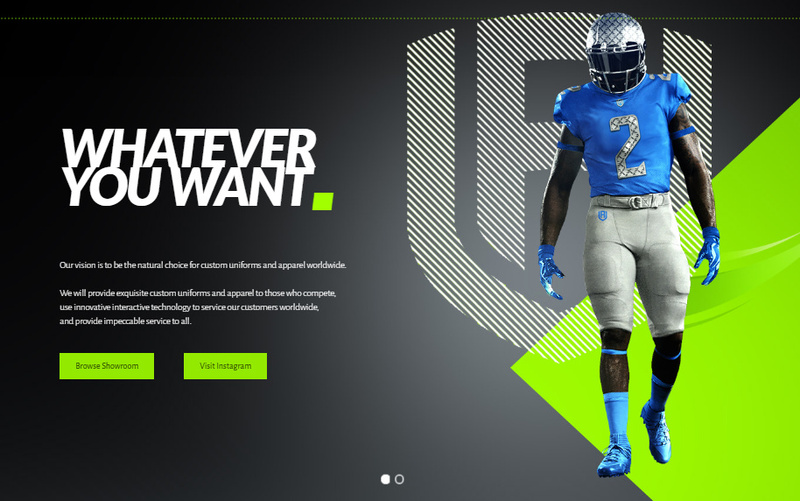 Building a recognizable brand - this is that point where you either go pro or go home. If you have great ideas, great look and great marketing, you’ll win it all. 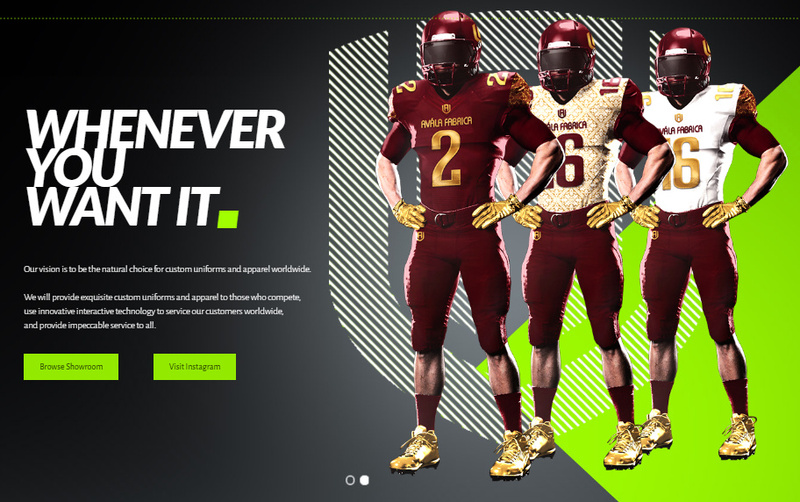 Players want to play for a team that looks like a professional one, fans want to have nice gear which visually is almost what Nike or NFL offers. Sponsors want to be a part of something what looks good and makes people think good of them. Good logo, professional looking graphics, videos, all social media networks are extremely important. Like I said before “fake it till you make it” is like a magic recipe. Even when we were a 2nd division team, we looked better than 90% teams in the league. Make people believe that you’re a big deal and good things will happen. Now, we have our fans, a lot of good players that are loyal and enjoy being a Falcons, despite of no earnings coming of it. You have to create as much hype as you can, and prove people that it’s all worth it. 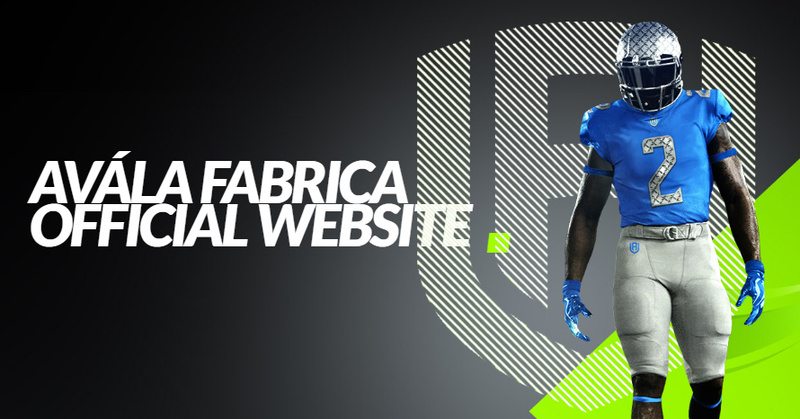 Goal is to become trendy to have your gear, play at your team and be a fan. Then your possibilities are almost endless. And of course, after all, it’s all about football, so you have to show progress year by year no matter if you win or lose, and as a team you have to get better and better with each season. Last but not least, don’t promise things you can’t provide or do. You don’t need no disappointment on any field,either it’s sport, fan or organizational. First is that cliche “never give up”. You just have to keep on running and swallow all the bad moments, because they will happen. When you are setting up a team, you will have to have a vision for it, it won’t be the best vision and it will change as the team evolves. You have to respect each others opinion, but as a leader you can’t accept all of them, because democracy is only good at the beginning. With time you’re starting to not be a team, but an organization, and you have to find yourself people who are very efficient and committed to tasks given to them. Take the time to listen to everyone who is willing to help, it’s extremely important. If you reject them once, they will never come again. There’s no easy way to the top, and by taking it reverse, the easy way won’t be THE WAY.